This snack takes me back to the streets of Thailand, ladies selling little bags of sliced fruits with a side of dried chili peppers and salt. 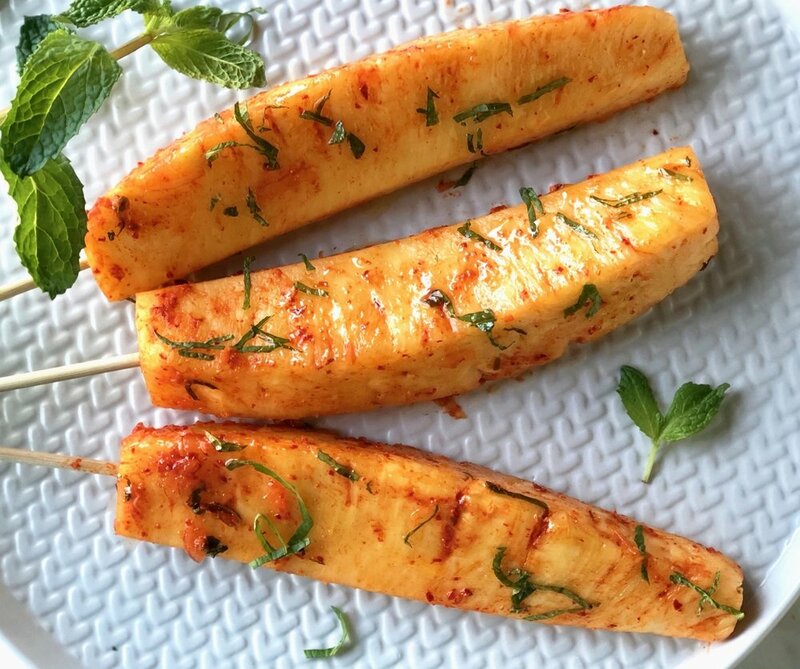 This pineapple skewer was inspired by those flavors - sweet, salty with a spicy kick. Cut the top & bottom off the pineapple; remove the exterior around the fruit. Cut fruit in half, then cut each half into quarters. Remove the core from each quarter. Slice each quarter lengthwise into 3-4 wedges. Place wedges into a bowl, toss in red onions and kimchi sauce. Mix gently with clean hands to ensure even coating. Place in the fridge until ready to serve. when serving, place each wedge through a bamboo skewer. Sprinkle with fresh mint chiffonade (prior to serving prevents discoloring). Can be made the night before to half hour before serving. Keeps in the fridge for up to 2-3 days. doing a BBQ? feel free to throw the skewers on the grill to caramelize. can also be made into a salad or salsa, using same ingredients, by simply cutting the fruit to appropriate size. recipe is also suited for other fruits such as firm mangos, apples, jicama, asian/bosc pears.